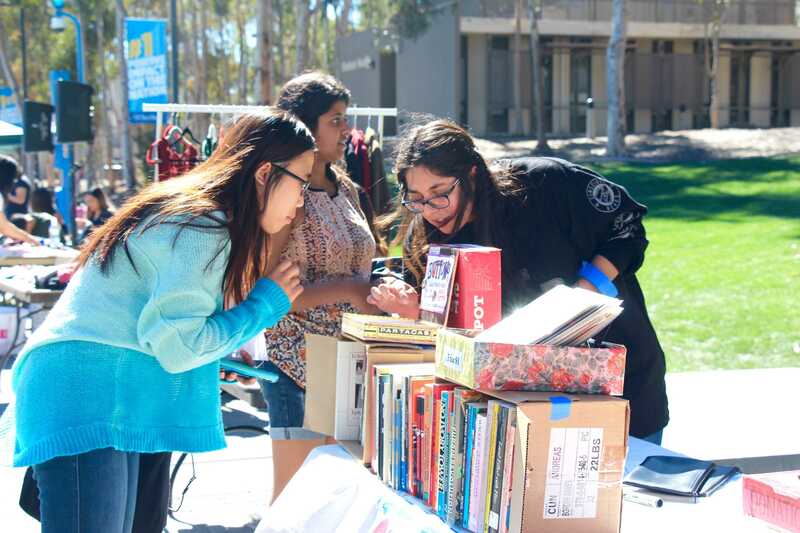 Student vendors lined Library Walk to sell used and artisan items on Tuesday as part of the A.S. Office of Environmental Justice Affairs’ quarterly Thrifty Thursday event. A.S. V.P. of Environmental Justice Affairs Moon Pankam told the UCSD Guardian that her office promotes the event to encourage the culture of sustainability on campus. “The goal of Thrifty Thursday is really to get students to be aware of the effects that their purchases have on not only the environment but also the people who produce these items,” Pankam said. Pankam told the Guardian that the event is also aimed at creating more awareness of the impacts of fast fashion. “Fast fashion is one of those industries that produces a lot of waste in addition to numerous human-rights violations that happen within those facilities and factories,” Pankam said. Pankam also noted that while the event is titled Thrifty Thursday, it’s not always held on a Thursday due to logistical issues. Many of the student vendors sold handcrafted items, including small bags and accessories. Warren College senior Noble Dwarika, who makes his pieces out of used fabrics, told the Guardian that buying handmade clothing and accessories is a good way to support small businesses and facilitate the recycling of material. In addition to clothes and accessories, students from Groundwork Books and Books for Prisoners offered used books for purchase. Marshall College junior Aditi Guatam, who volunteers at Groundwork Books, told the Guardian that the bookstore gives UCSD students the opportunity to purchase books from a student-run, nonprofit source and provides them with a selection of books that they will not find anywhere else on campus. Muir Senior Fabiola Orozco, another volunteer at Groundwork Books, added that the store is also a place where students can meet to discuss these issues. Both Guatam and Orozco have put this motto into action by getting involved in Books For Prisoners, a nonprofit that sends books to prisoners who request them. UCSD forced Books for Prisoners out of its office space two years ago, after which the group could no longer operate and took students until last quarter to revive the initiative. Regarding the presence of Groundwork Books and Books for Prisoners at Thrifty Tuesday, Pankam expressed support for the participation of additional student organizations. “To have it be an event where we just sell clothing and handcrafted pieces would take away from the spirit of the A.S. EJA office, which is to advocate social issues and how they relate issues of environmental stewardship and sustainability.” Pankam said.